January 17, 2013 – Shortnose Spearfish on the Fly! Today, Chris, his wife Diane and children joined me for some flyfishing action. My boat has been out of commission for the last few days because the dive boat in the slip next to me got tangled up in one of my outrigger lines and as he left his slip completely folded my outrigger in half! Not a pretty picture! Needless to say, Chris contacted me and wanted to do some flyfishing so I didn’t need the outrigger on the port side anyway…perfect! My friend Mark joined me since I would need some help teasing fish within flycasting range. We met at the dock a little later as usual since the swell has been pretty big along the shoreline. Chris has caught several tarpon and other large gamefish on the fly so I knew he could handle throwing big flies on heavier rods. We practiced a few times on the way out and Chris made perfect cast after perfect cast. All we had to do was raise a fish or two which would be the more difficult job … We started off in front of the harbor and saw a boat fighting a nice 300-400lb blue arlin which they broke off on the leader. We worked south along the 500-700 fathom line for most of the day without a bite. We had marked 2 fish down deep so they were in the area but not ready to bite. Mark and I were up top stressing out about not raising a fish when a spearfish boiled on the long teaser! Mark quickly got to the rod and started teasing the fish in as Diane cleared one of the other teasers. Chris dropped his fly back and got ready to cast as Mark teased the fish right to his fly. As I pulled the boat out of gear Mark yanked the teaser out of the water and Chris made a perfect cast. He stripped twice and the spearfish piled on his fly. He was on! The spearfish made a short run and came off! I yelled to him to trip it back in and the spearfish made repeated attempts to eat the fly. Finally, after what seemed to be 5-6 bites, Chris set the hook deep and the spearfish made a series of jumps towards the boat! After a 10 minutes battle Chris successfully landed his first billfish on a fly! 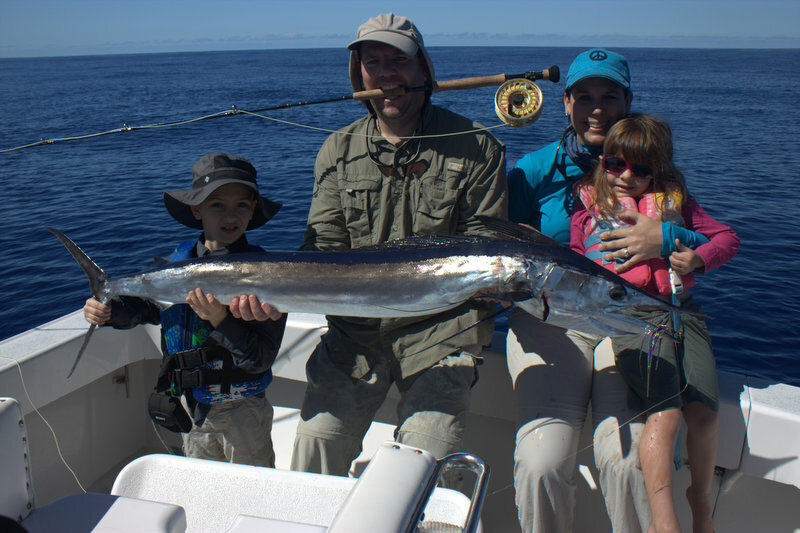 We estimated the spearfish to weigh between 20-25lbs! We have been seeing more and more of these fish along with striped marlin so the next few weeks should be excellent fishing!